Author's Note: I thought of this story at a stop light. 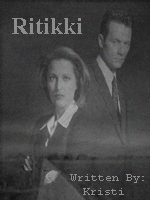 Summary: Doggett and Scully investigate strange happenings in a little hick town. Disclaimer: Mulder, Scully and Doggett belong to Chris Carter, Ten-Thirteen Productions, and 20th Century FOX. A man gets out of his car... it's very late. He is picking up his clothes. Inside the dry cleaners we see a woman (30s) go to the back to get the mans clothes... the man gets out his wallet. The POV moves closer and is now behind the back bumper of the man's car. The woman inside comes back out, the man pays her and leaves. The man gets in his car. The man turns on the ignition. The man pulls out of the parking lot. The man is now at a stop light... his head is bobbing to the music he is plahing. The man stops when he hears a noise from the back seat. He turns down his music and glances back from the rearview mirror. The light goes green. The man goes. There is a growl from inside the car... the car begins to swerve all over the road. The man screams from inside as the car hits a street light... all goes silent, save for the horn honking. Police officers have taped off the area. People are standing by watching and waiting for answers. A red pick up truck pulls up. Everybody watches eagerly as Agents Scully and Doggett step out. and Scully of the FBI. Uh... agent Mulder wans't able to come. The Sheriff looks at them. Then that's make her agent Scully then. The Sheriff looks over to the car. car hit a street light. The Sheriff continues to talk. We have no reason to be here. want to come all the way out here. you said there was an abduction. The Sheriff's eyes light up with joy. Scully and Doggett exchange an irritated glance. He waves them over to the car. Nobody here knows this man. Doggett and Scully look inside the car. There is a man half in the front and half in the back... cut in half. Doggett winces. with an examination of the cut. Scully has just finished her autopsy... she covers the body and takes off her gloves. Doggett walks in. Scully lets out a sigh. But he was found in the car. She puts on a new pair of gloves... and hands some to Doggett. She pulls the blanket off the man... but still covering him. Scully looks up at him... amused that he is disgusted... she let's out a little laugh. She points to the man's chest. Doggett looks... but not as close as Scully does. some kind of mucus on him. The door to the autopsy room opens... the results are back. the results for that... stuff. The Lab Dude leaves. Scully opens the envelope. She studies it for a second. Doggett looks over her shoulder. Scully gets some off the body and show Doggett. She puts it right up to Doggett's face. He makes a disgusted face and backs away. Well... he is a kid, Agent Scully. Doggett gets out his cell phone. He turns to Scully in disbelief. Scully waits for answers. He hangs up and puts his phone away. Scully and Doggett are sitting across from the man from the teaser. The man is looking down... Scully and Doggett seem bored... not getting anywhere. why you left your car. Scully leans over to Doggett. be in a car crash. Doggett looks over at Ritikki. wrapped around a street light. Scully's head falls into her hands. But you said you were abducted. Doggett looks at Scully, but her head is still in her hands. a single scratch on me. Doggett takes a sip of his coffee. How can time just stop? Hey, I know what happened to me. you're working for the government! Ritikki gets up and walks out the door. Scully lets out a sigh. But not what really happened. It's just getting dark outside... a few threatening clouds in the sky... but peaceful. The diner isn't too full... mainly the regulars sitting in a corner gossiping. Scully and Doggett enter. All of the talking stops as they walk to the counter. All eyes are on them... waiting for anything to happen. The cook, Jimmy, comes over to them. He gives them a goofy grin. Doggett and Scully sit down. Jimmy hands them a menu. Would ya like to hear our specials? Scully is still looking in the menu. have a salad with lemonade. uh... and a root beer. Doggett shakes his head yes and hands the menu to Jimmy. A few moments later he hands them their drinks. A female regular comes over to them. Doggett and Scully look over to her oddly. Doggett give a littl wave. Scully sets her drink down and looks at her. Another regular is behind them taking notes. Doggett notices and signals to SCully. Jimmy comes over and give them there food. Could we get this to go? He give them a goofy grin. Have you ever been abducted? Doggett and Scully exchange a look. The agents have to leave. truth of Breier Ridge County. I've gotten it under control. Scully is looking at the case file, wearing her glasses. The door opens. It's Doggett. So I'll take teh couch. Doggett untucks his shirt and sits on the couch. I think I'm beginning to get it. She finally looks up from her file. Yeah. (beat) Ritikki was abducted. Scully sets the file down. Doggett thinks about it for a moment. Then this is an x-file. the mystery about that one man. Alright, we're on our way. answer to the myserious 'John Doe'. Doggett gets on his jacket. Scully and Doggett have already arrived. The Sheriff is showing them a file. claw mark on his chest. He hands them another file. Suddenly, Ritikki burst through the door! I confess! (beat) I wasn't abducted! Ritikki seems to be in a panic. Just sit down and take it easy. She helps him sit. Ritikki begins to cry. Scully looks up at Doggett. That's wy he was in the car. was helping me save him. Where is your brother now? Ritikki continues to sob. The Sheriff comes with a kleenex box and conforts him. Scully goes over to Doggett. end it's nothing more than a tragedy. His office is clean... for once. But he now has a dart board... on the door. Mulder stands in front of his file cabinets... aiming at the dart board. He's aobut to throw... WHEN!... the door swings open. (beat) How was that 'x-file'? Scully puts her things on the desk. I'll write up the report. Mulder laughs a little and Doggett leaves. She takes a seat in front of the desk... looks around and notices that the office is clean. She gives Mulder a look... he shruggs. A man in his 20s is driving a red porsch... speeking of course. His music is loud... 80s music at that. He's a cool dude... wearing dark sun glasses. OUR POV changes to the POV of the BACK SEAT. A hairy claw comes from behind and grabs teh man. We see the man strugling to be free from the hairy claw... but we do NOT see the body. The car swerves and hits a tree right on... glass shatters everywhere. The music has stopped playing... and the only sound heard is that of the horn.